Hello everyone! 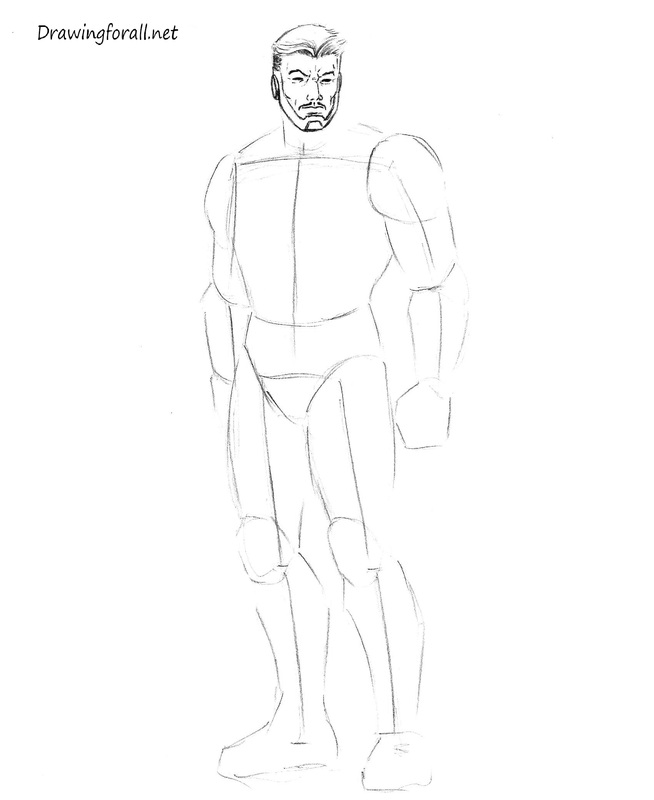 Today we prepeared a new drawing lesson, devoted to Marvel Universe. 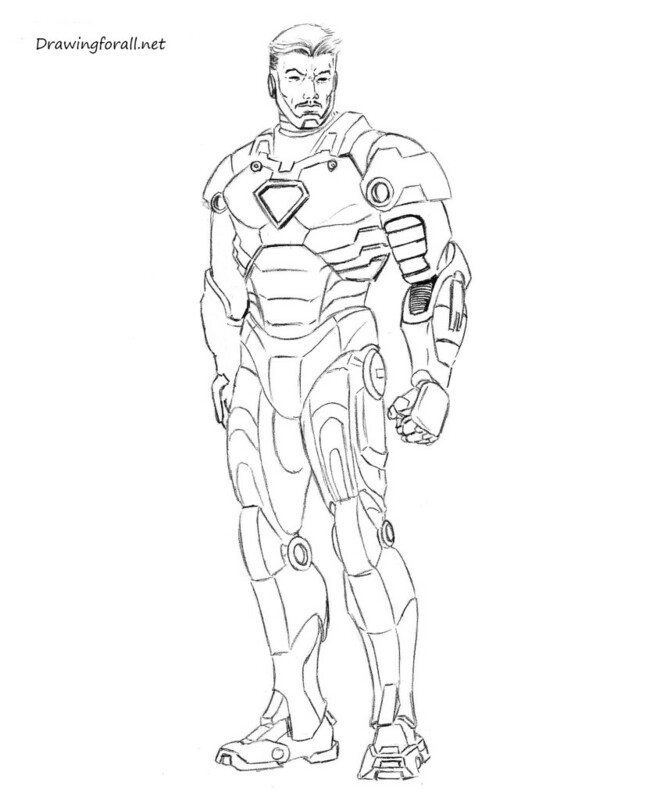 And the main character of the this post will be legendary Iron Man. Iron Man, whose real name is Tony Stark, is one of the most recognizable members of the team “Avengers”. Frankly, many of those who attended the movies Avengers, wanted to see another film about the charismatic genius of Tony Stark. 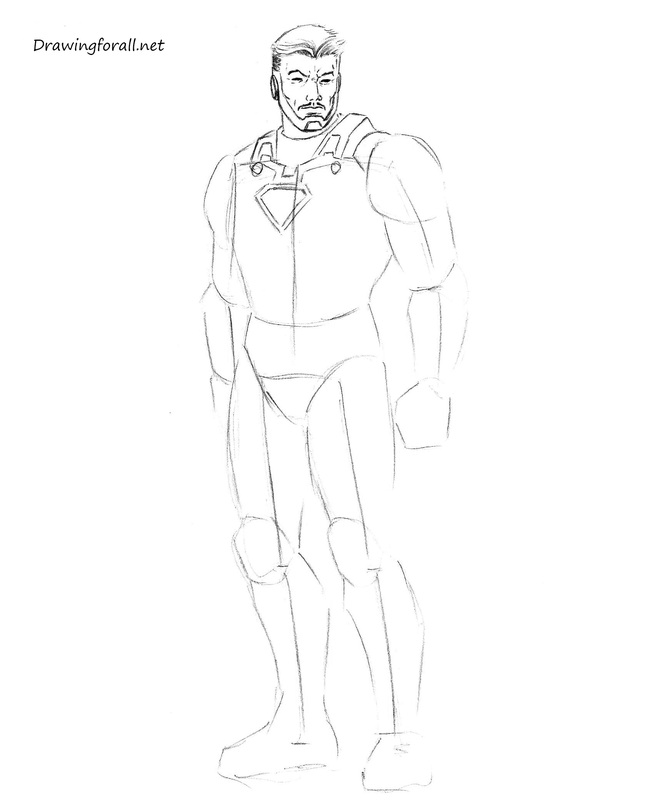 By the way, today we are going to draw Iron Man without a helmet. But it will not be particularly difficult. Let’s start our lesson! 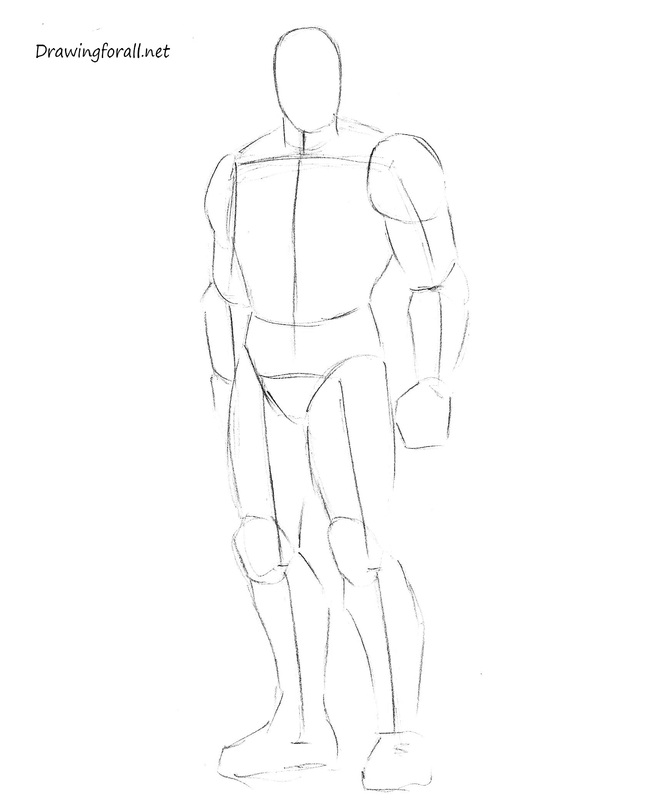 The first step draw a stickman. 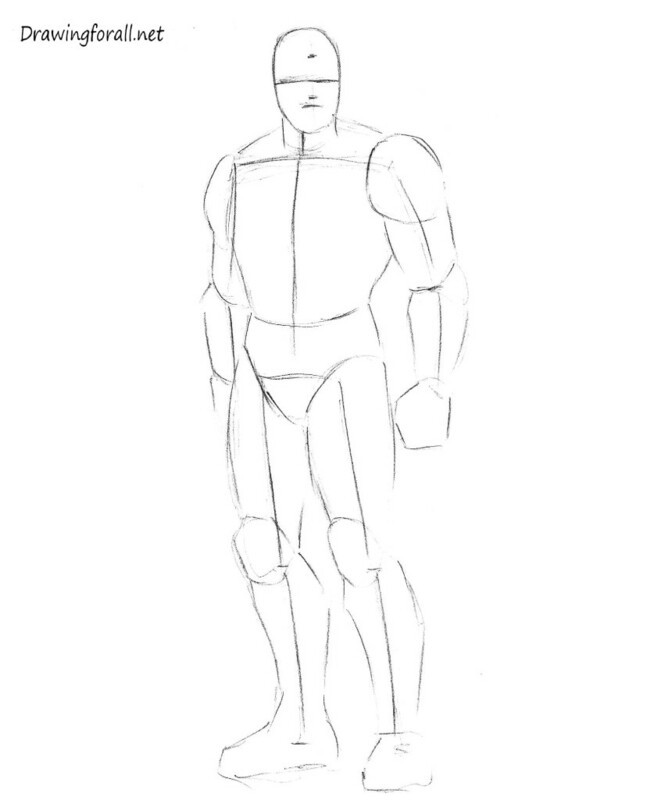 We draw the stickman to sketch out general proportions and posture of the character. 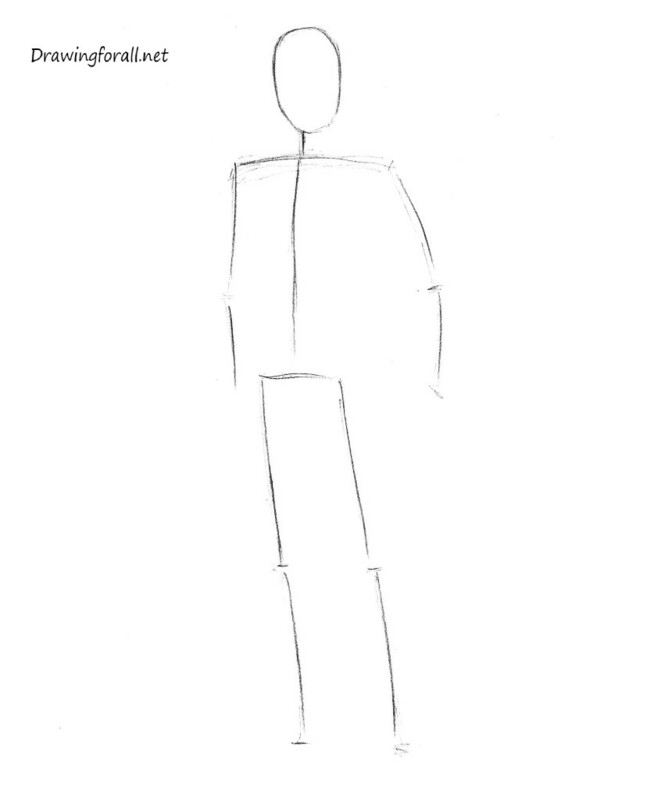 Look carefully at the proportions of this stickman. Look at the length of the head and relate it to growth stickman. The length of the head should be equal to 1/7-1/7.5 part of the growth. Shoulders should be significantly wider than the pelvis. 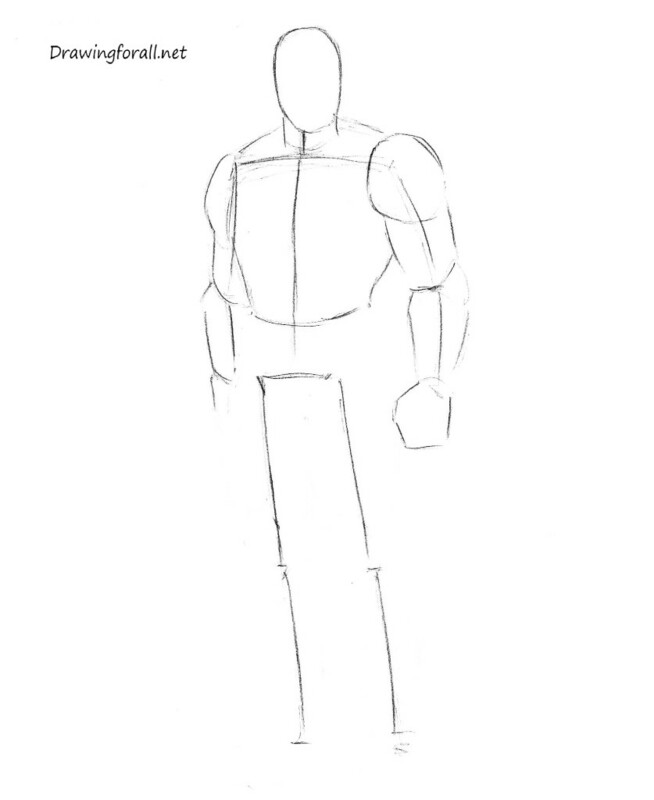 In this step, you add volume tothe upper part of the stickman. 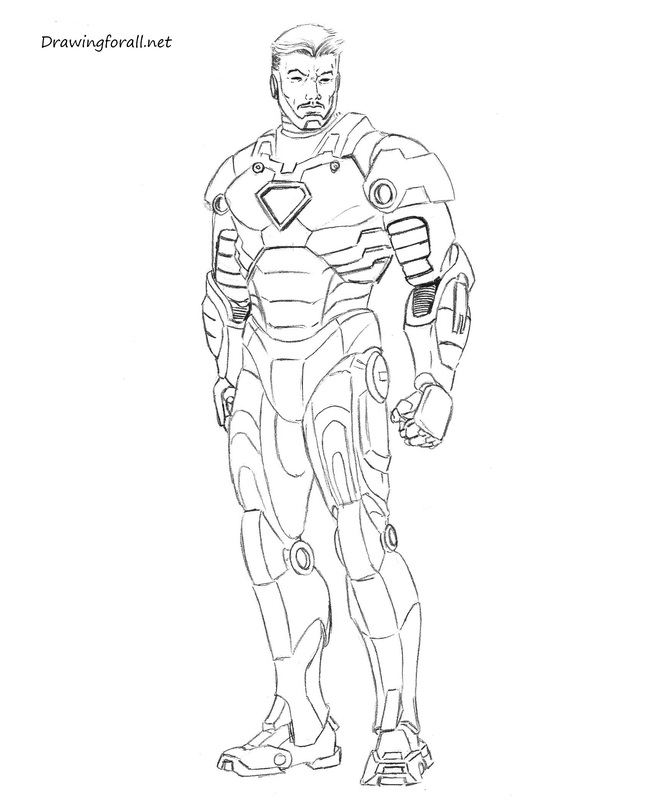 Don’t forget the important thing – Tony stark dressed in the massive suit, and therefore the contours of the body he will be somewhat larger than the average person. Hands should be large and massive. The torso should be wider at the top and gradually narrows to the belt. By the way, we have a drawing lesson about Spider-Man, beloved colleague of Iron Man. To the lower body all a bit easier. Inguinal region and the belt look like a triangle. Hips can be denoted by the cylinders and the knees – hexagons. Do not forget that feet should be larger than a normal human because heavy armor. Inside of the head draw a line, which will help us to draw eyes. This line should be placed approximately in the middle. Above this line, draw another for help hair’s drawing. 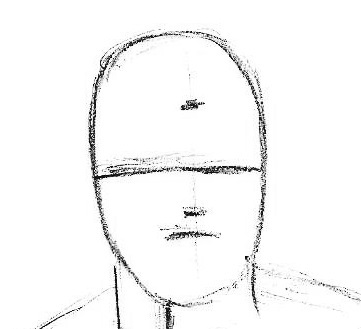 Below the line of the eyes draw another line which will be the reference point for drawing the mouth. Draw hair (to draw from the roots to the tips). Light touches of planned eye and eyebrow. Also here we draw a nose and mouth. 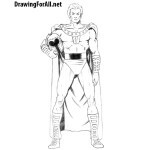 Complete drawing faces. 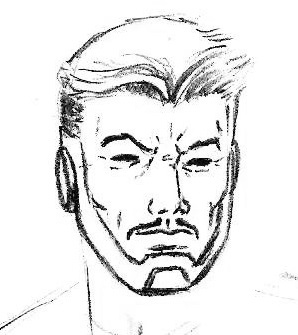 Draw wrinkles and lines mustaches. 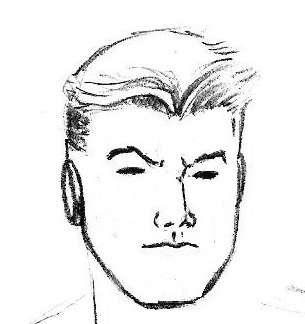 In the lower part of the face draw the armor that hide the chin. Face and head painted. Now draw the upper torso. In the center of the chest draw famous plate under the neck draw tight collar. Draw the pieces of armor Iron Man, located in the area of the shoulders. 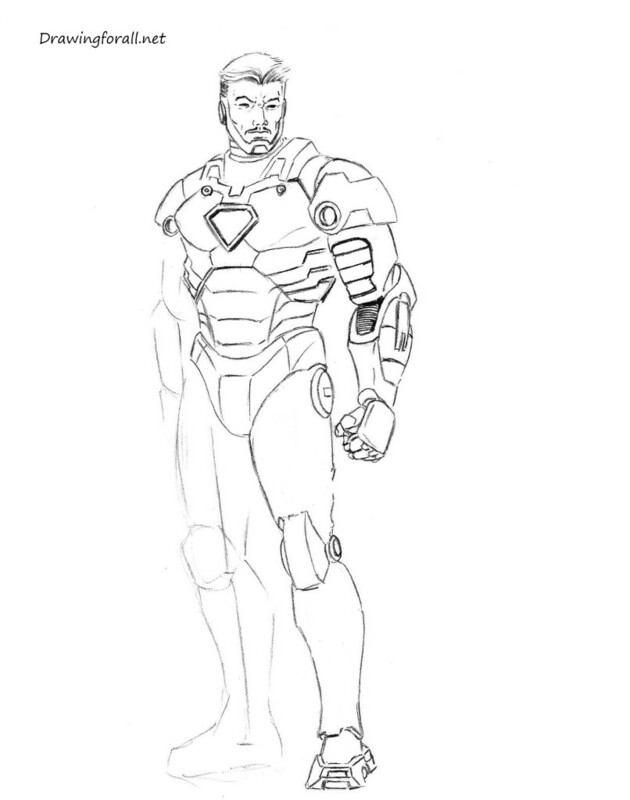 This is a lesson on how to draw Iron Man, and we continue. 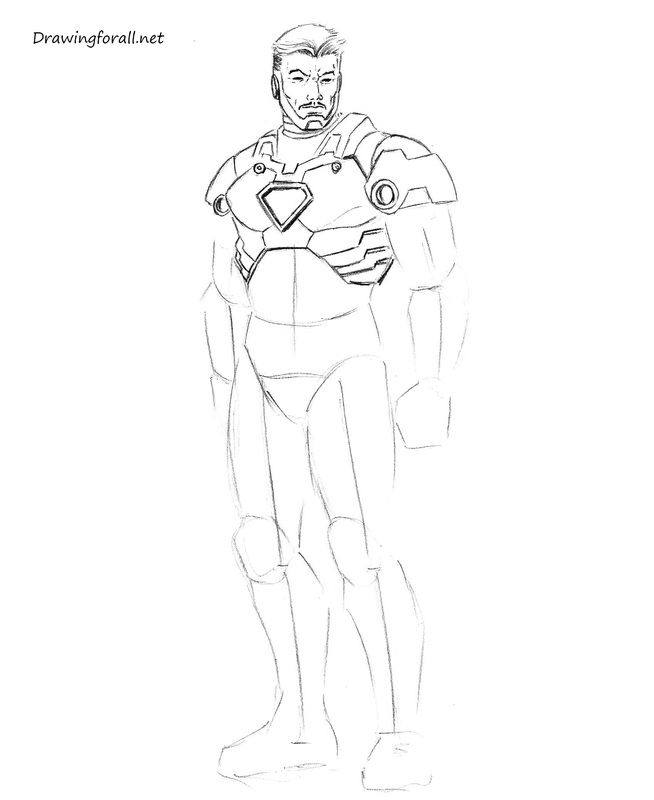 Draw the armor on the chest muscles and ribs. 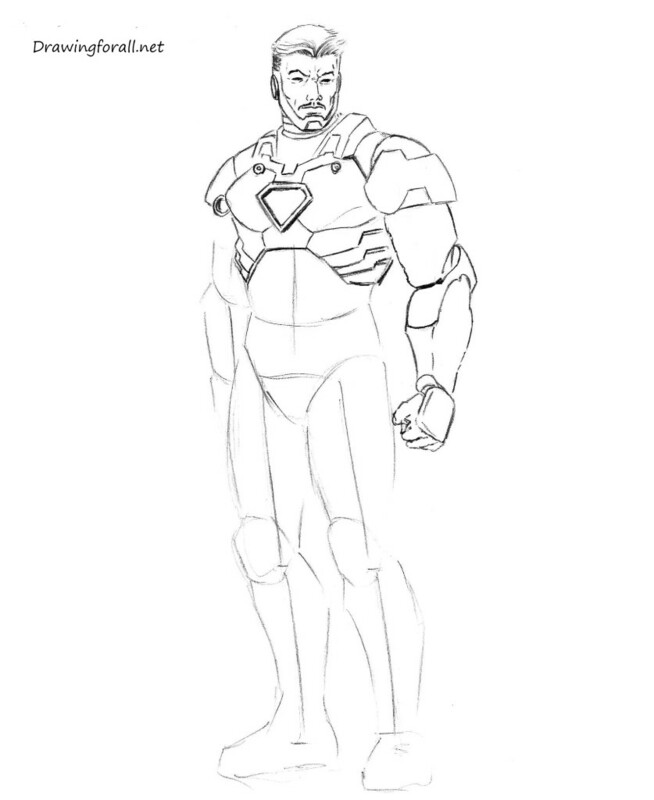 Also, draw the armor on the shoulders, the biggest detail is of the form volume key. Draw the shape of her armor at close hand to us. So, add details and draw in the bicep area long plate. We will work on the outer part of the forearm and add one square plate on each finger. 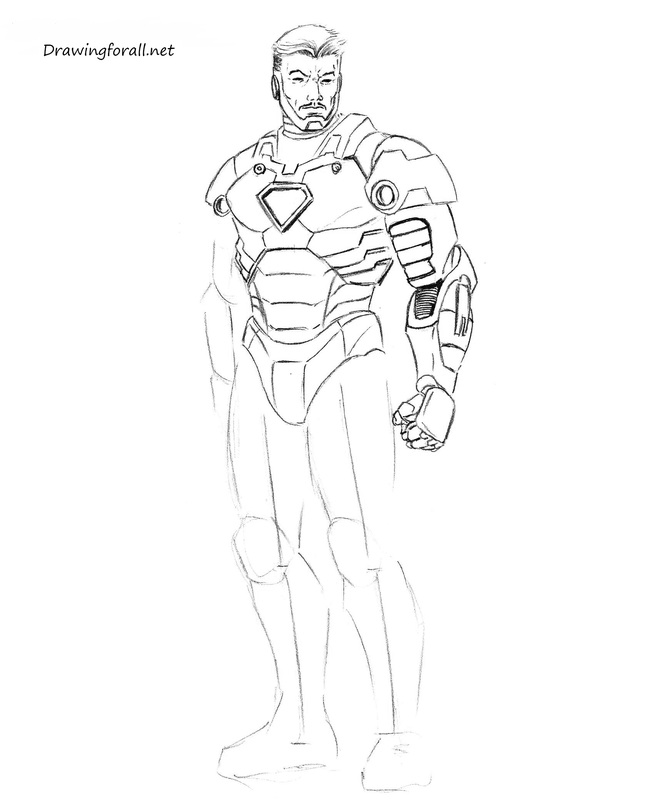 Now draw the armor on the lower part of the body of Iron Man. The armor covering his groin, looks like a triangle. Draw your reservation at close to us leg. 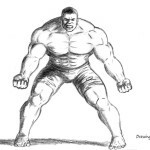 When drawing you should rely on already drawn the contours and outlines. 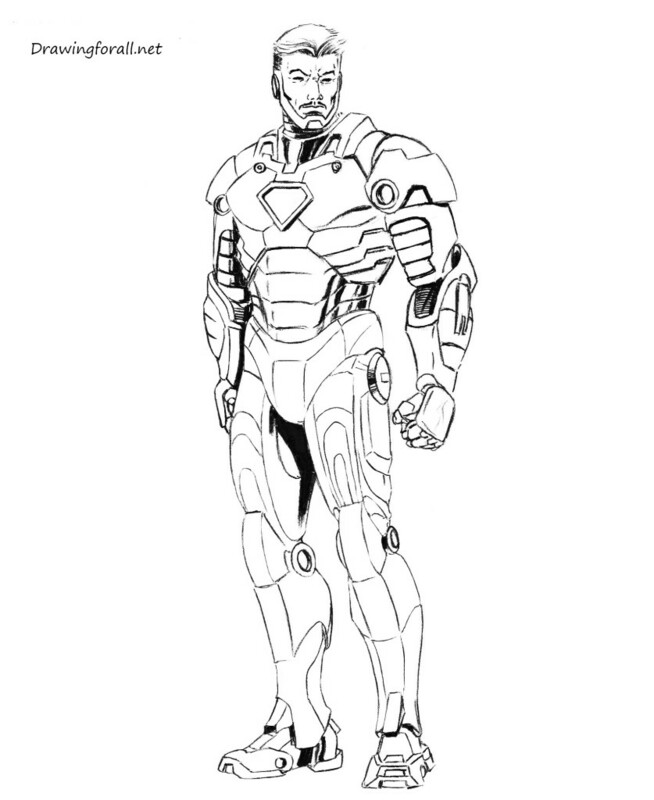 Don’t forget draw armor details located on the foot. 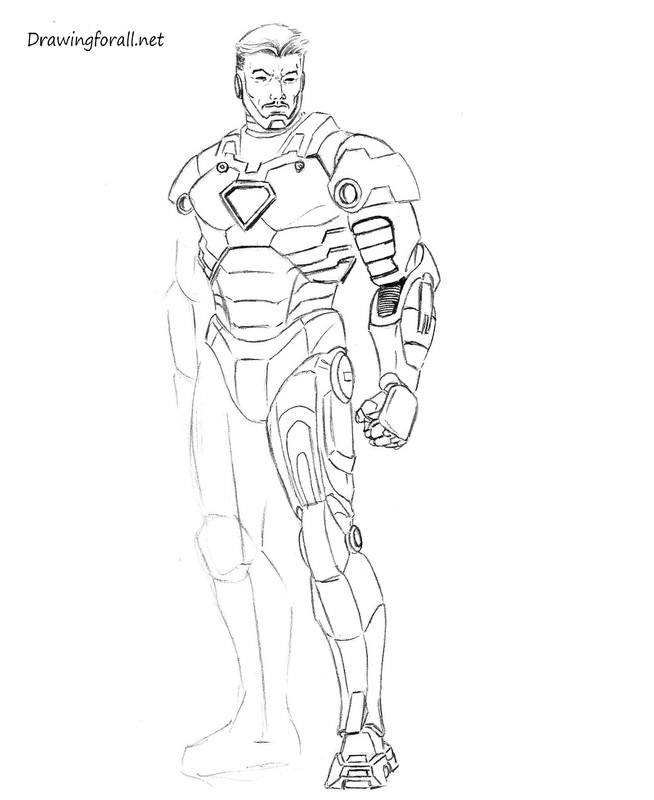 Continue to draw the leg of Iron Man in detail. On the side of the thigh, draw plate, similar to the volume bar. In complete analogy with the previous two steps, draw right leg from us. 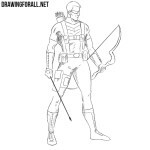 Draw the details of armor left from our hands. Put biceps crisp lines, draw the contours of the forearm. 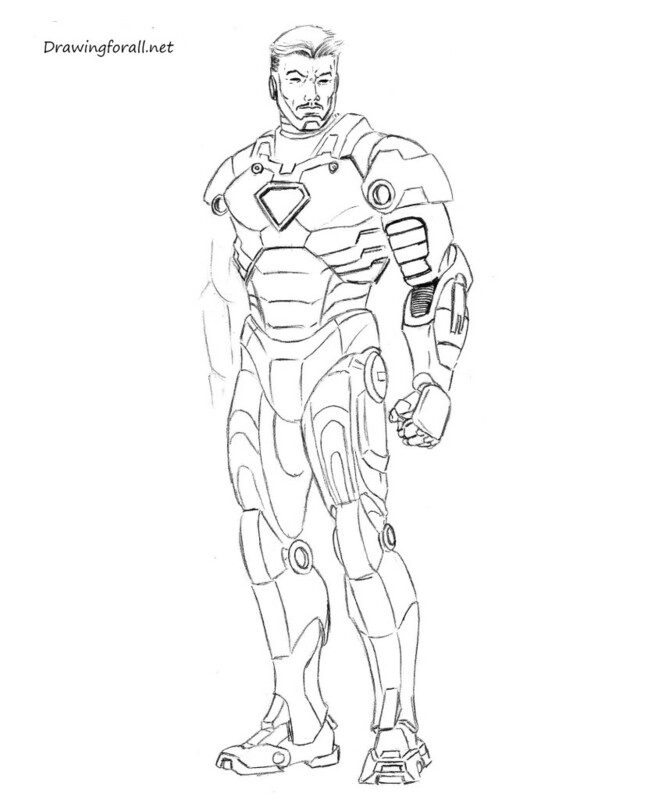 Lesson on how to draw Iron Man is a good example of a comic style drawing. This means that shadows will be rough and full of contrast as black spots. Shadow it is best to apply in two stages – first draw the outlines and then color them. 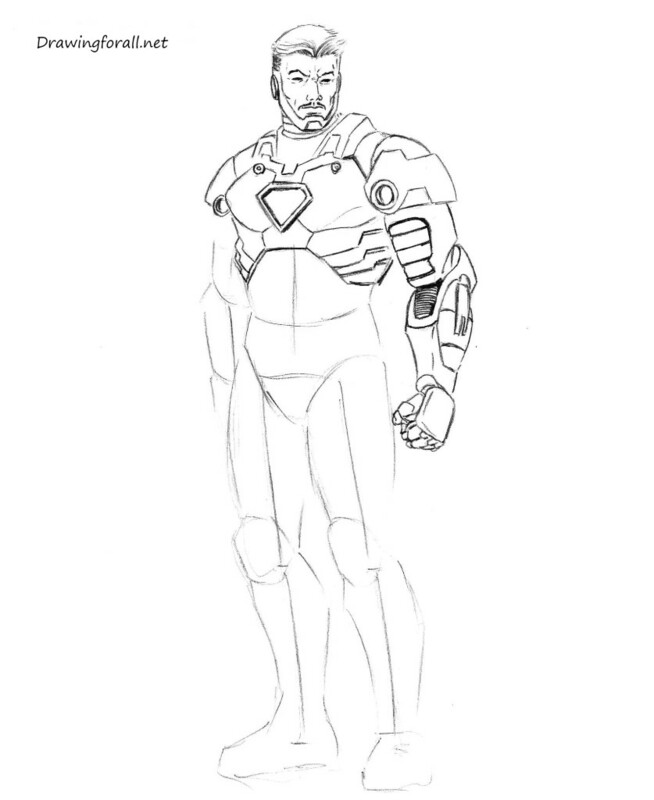 It was a drawing lesson in which we told you about how to draw Iron Man. 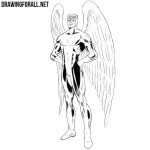 We will meet with you in a new drawing lessons on our website. Thank you for this tutorial. It’s awesome. I loved this tutorial its easy to draw.